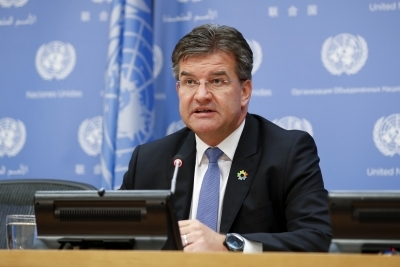 United Nations Sep 14 (IANS) UN General Assembly President Miroslav Lajcak has said that the Security Council reform process has made headway in the past year and "we are getting closer to agreeing" on what it should be like. Emphasising the need for a reform he told reporters on Thursday that the inability of the Security Council to unite and act overshadows the positive work of the UN and the entire system "gets criticised harshly". Therefore the importance of the reform process "goes well beyond the role of the Security Council" he said. Lajcak said that he had tried to ensure that the reform process was a credible one "and I think we succeeded on that". "I think here the views of different member states would differ " he conceded. "For some we went very far; for some others this was not far enough." The Intergovernmental Negotiations (IGN) as the reform process is known was unable during the current session of the General Assembly to agree on a negotiating text the most fundamental requirement for meaningful negotiations and in June rolled over the task to next session that begins later this month. Lajcak appointed Ambassadors Kaha Imnadze of Georgia and Lana Nusseibeh of the United Arab Emirates as co-chairs of the IGN to revitalise the process stalled for over a decade. "The current composition of the UN Security Council is not representative because it does not reflect the realities of 2018 of the 21st century. It copies the realities of 1945. So therefore the call for reform is just and it is not denied " he said. Despite a universal acceptance of the need for change the reform process faced practical issues "like if expanded to how many members? What about veto rights? What about permanent non-permanent semi-permanent?" But he added that the UN members "have to feel that the Security Council represents them all and they have to identify with the work of the Security Council. "And this will not be the case for as long as there are important countries that believe that they are not adequately represented or continents and obviously starting with Africa." Lajcak said that he was certain that the member states would not allow the reform process to become a "routine question" and go around in circles. "Honestly I was taken aback by the level of emotions and also the level of frustration when we started the discussions about Security Council reform during this session " he added. "The Member States have very clear very strong positions and many of them will make sure that this will not become a routine."